This week's gallery is the letter C. It would have been too easy just to show you my lent swear box. Yes, ok , it's not mine but it is the funniest part of Hot Fuzz. But instead I decided to declare midlife crisis season open. What do you do when you look in the mirror and see a stranger staring back at you. When each day brings a new line or blemish you hadn't noticed before. When aches and pains are part of the morning routine. When you feel trapped by life and responsibility. 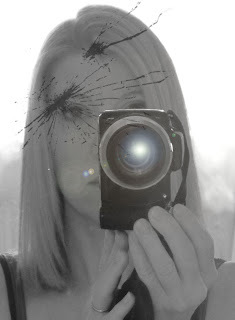 I tried shooting myself, literally, but to be honest my photoshop skills are about as good as a 5 year old on Picassa. Maybe I'll just buy a new phone to keep me occupied until my fading eyesight means I always look soft focus in the mirror.